Anneke Stewart is an artist of the most innovative kind. Fresh faced to the contemporary art world, and talented in multiple artistic mediums the future is bright for this young creative. 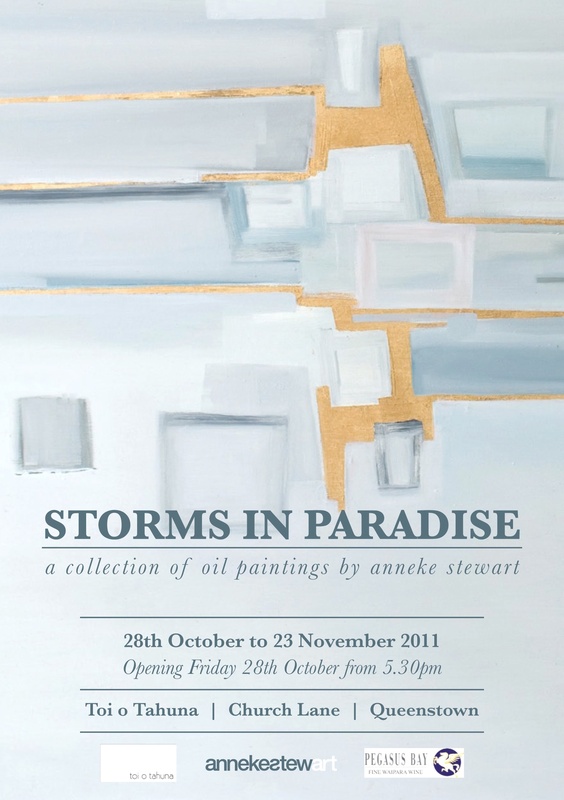 As a 2011 Bold Horizon Finalist, Stewartʼs latest collection of oils ‘Storms in Paradise’ is one not to be missed. It’s a collection developed during time spent at the precious and historical Paradise Guest House in Glenorchy, and grew to include overlays of influence from time subsequently spent in Wanaka, the Marlborough Sounds and rural Canterbury. Described by the artist as ʻtherapeutic evolutionsʼ her debut exhibition reflects the nature of healing within the context of a southern paradise. Stewart has a decidedly unique style of painting. The geometrically patterned works belie and reference the intuitive journey each painting becomes. That journey can be beautiful and traumatic, effortless or tediously frustrating. Stewart sees the evolution of her work, as symbiosis with her own life’s flight and that of the early pioneers with the need to paint as one of her the most prevalent instincts. The works are highly inspired by the colourful and fascinating past of Central Otago, reflected in the predominant use of gold and some silver leaf on the paintings and gilted frames. Storms in Paradise not only refers to the literal storms or poignant weather experienced in these iconic New Zealand landscapes, but also refer to personal experiences processed over this period. Stewart has applied a kind of alchemy to her art in a beautiful, emotive, and deeply personal way.